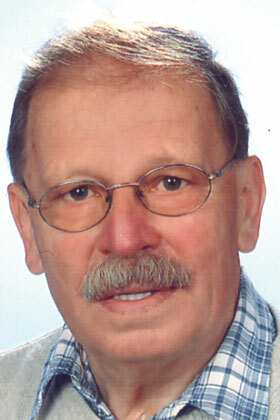 Engelhard Boehncke was born in 1935 near Göttingen in Germany, as the first of six children. He started his professional life and career “hands on” working as apprentice on farms in Germany and France. During his studies of agriculture at the University of Göttingen, where he graduated with a diploma in agricultural science, he worked already in 1959 as an intern in one of the oldest biodynamic farms in the world, the Oswald Farm in Switzerland. It was there the foundation was laid for him to become an outstanding pioneer in the organic movement. His love for animals and his desire to learn much more about them led Engelhard Boehncke to studies of veterinary medicine at the University of Giessen. 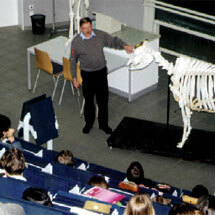 From there he moved on to the veterinary faculty at the University of Munich, where he did his PhD. During his studies and work in veterinary medicine he was confronted with the use and negative impact of antibiotic growth promoters in conventional agriculture. He could see the drastic development of bacterial resistance to antibiotic remedies in (human) medicine. This was for him a “point of no return” on his way to become a “world personality” in the organic movement. In 1975 he followed a call as professor at the University of Kassel/Witzenhausen in Germany, where he right away left no doubt not only where his heart beat but even more so what he was going to teach his students. In those days it took a lot of courage to fundamentally challenge the conventional system and so called logic of “modern” and industrial animal production and to research instead in organic agriculture and animal husbandry. Having been responsibly and successfully involved in the organization of the 1984 IFOAM Organic World Congress in Witzenhausen he was elected there at the General Assembly of the world umbrella organisation IFOAM to serve as chairman of the Board of Directors. 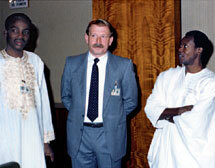 In those days the federation suffered President of IFOAM at the World Congress in Burkina Faso 1989 from a great lack of funding, which consequently led to a lack of international awareness and recognition. In his four years (two terms) as Chair Engelhard Boehncke was instrumental in, in the best sense of the word, directing IFOAM on its way to become a real global organization. By the beginning of 1989 at the latest, with the Organic World Congress in Burkina Faso/ West Africa IFOAM had developed from a Euro-centric small international network to a world organization across all the continents. Engelhard Boehncke with his wisdom, patience, integrative capacities and especially with his good sense of humour held the movement together in times when different “schools of thought” and sectors of the organic movement were sometimes even moving from arguing to “battling”. After serving the worldwide organic movement Engelhard Boehncke returned to focus on the welfare of animals by accepting the presidency of the International Association for Animal Husbandry based in Switzerland. In this capacity he was very successful in creating increasing awareness in politicians and governments and in the public at large of animal rights and organic animal husbandry. He was also instrumental in establishing an “animal husbandry” award funded by the German Schweisfurth Foundation and later by the Felix-Wankel Foundation for young scientists working in the field of farm animal ethology and appropriate housing. Not only as IFOAM Chairperson was his impact global. He was by great popular demand lecturing all around the world making sure that beside the dominating soil and plant science in organic agriculture animals also received fair attention. His international “expert” authority and global network was a perfect foundation to accept the responsibility to organize the first International Congress on Organic Animal Husbandry, which took place 1991 in Witzenhausen. Not only the 305 students, who wrote their diploma theses under the guidance of Engelhard Boehncke and the 10 PhD graduates experienced great inspiration from the “Professor”. His popularity among the students (and not only the organically minded!) was unrivaled at the university and this not only because he gave fantastic lectures, but also because he showed great skill in explaining very complicated scientific matters in a way that made sure that his knowledge benefited farm animals and farmers alike. Despite his age Engelhard Boehncke still occasionally lectures on animal husbandry and among other activities he serves as a member of the advisory board for the German journal “Ecology and Farming” of the SÖL Foundation. He also still serves as member of the jury for the above mentioned animal husbandry award. Strongly rooted in the organic farming community and in his institute for animal husbandry at the University of Kassel, Engelhard Boehncke with his personality and enthusiasm has not only shared his vision of an appropriate and thus organic animal husbandry, but also encouraged generations of farmers, scientists and especially young people to get involved. As laureate of the OWA Lifetime Achievement Award not only is a person recognized and honoured, who has been part of the organic movement locally as well as globally for half a century. Tribute is also paid to a person who has put the fate and well being of animals centre stage in the organic movement. As a man of powerful “words and speech” Engelhard Boehncke, with his almost 50 years of dedication to organic agriculture, is a pioneer, a motivator and encouraging leader within the worldwide organic movement.